The government is in a hiring crisis, and action is needed. As retirees leave the workforce in droves and the public sector lacks the attractiveness of the private sector, an applicant shortage has developed. If this is not rectified, the quality of service provided to citizens will be negatively impacted. To understand the scope of this issue, NASCA teamed up with NEOGOV and Accenture for their report, Job One: Reimagine Today’s State Government Workforce. Launching multiple, separate investigations, we completed research that came to the same conclusion: the future of the state government workforce is in jeopardy. Research found that job openings in the public sector have been increasing for the past 5 years, creating a significant increase in demand for applicants. The number of job postings in state government had increased by 11% since 2013. However, more alarmingly, the number of applicants for those open positions has declined by 24% since 2013. This has created an estimated gap of 35%. If the gap continues at this rate of change, it is expected to widen to 70% over the next five years. If the government cannot staff open positions, because the supply of applicants cannot meet the demand for jobs, the quality of service provided by government agencies will likely be negatively impacted and our communities and citizens could suffer. So, why have government job openings increased while applicant numbers have decreased? Some potential contributing reasons include the “silver tsunami” (the vast number of retiring baby boomers), erosion of the traditional value proposition of job security in the public sector, and increasingly frozen benefits plans for new workers. The efflux of baby boomers retirees from the workforce has been anticipated for years. Now that it’s here, 10,000 baby boomers are retiring per day. That equates to 11% of the population retiring by the end of the year, and the workforce cannot keep up. By 2020, an estimated 37% of the workforce will be comprised of retirement age workers (Bureau of Labor Statistics). Secondly, the traditional value proposition for government employees is eroding. The main driver of public sector work has been job security, but past events have affected perceptions of government work as offering job security. Government layoffs that resulted from the recession of 2008 may have painted a less secure picture of government work. According to the 2019 State Budget Overview from NASBO (National Association of State Budget Offices), in the five years following the recession, states reduced their workforce by 183,500 people. That’s a 6.5% reduction in the workforce from August 2008 to December 2013. This reduction does not showcase security for job seekers. And, although it took place after the data was collected for this report, the recent government shutdown is yet another contributor to changing attitudes about government job stability in general. Finally, benefits plans are not being offered to new workers at the rate they once were. Benefits packages have been one of the most attractive features of working in the public sector. NEOGOV asked respondents what the appeal of working in both the public and private sectors are, and 58% listed benefits package as a top reason for seeking work in the public sector. 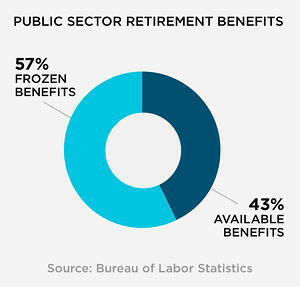 According to the Bureau of Labor Statistics, 57% of benefits plans are frozen, making them inaccessible to new workers. The cause of this is government organizations struggling to keep up with the benefits promised to an unprecedented outflow of retirees. PEW Trusts reports the gap between assets and benefits promised reached $1.4 trillion in 2016. In addition to a reduction in benefits packages for new employees, healthcare costs for government have increased. From 1998 to 2011, the monthly employee contribution for state and local government employees increased by almost 3 times, from $31.94 per month to $90.90 per month (Bureau of Labor Statistics). In short, the most attractive aspects of government work no longer exist to the extent they once did. State chief administrators and HR directors have increasingly become aware of the burgeoning problem and have validated this data, but how can it be addressed? When asked to rank their three greatest workforce challenges for Accenture’s survey of State Chief Administrators, respondents cited “Difficulty attracting new employees to work for the organization” (42%) and “Increasing number of retiring employees” (36%). Although employees will continue to retire, governments can become more attractive to job seekers. NASCA, Accenture, and NEOGOV’s Job One Report explains the need for reshaping recruitment in state governments. Modernizing job descriptions, developing your existing workforce, and building your brand are some of the recommended ways to combat the current hiring problem. One suggestion in the report is to attract job seekers by updating job descriptions to display the appeals of working in the public sector, such as doing meaningful work and serving the community. The report also reminds government employers to keep in mind that in addition to recruiting new job seekers, it’s also important to retain the existing employee base. By developing the skill sets of remaining employees, you will be able to create a sense of belonging and pride among your employees. If they see a path to promotion and know their skill set is being improved for a purpose, they will be more likely to stay. Additionally, understanding how your organization is perceived is important in today’s hiring climate. Build a brand that employees can feel connected to and that job seekers will want to be a part of. That’s one way to close the gap. From 2013 to 2018, NEOGOV analyzed the recruitment data from 27 state agencies representing 259,911 job hires with 14,910,284 applicants. Between September and October 2018, NEOGOV surveyed 2,959 job seekers across multiple age groups seeking jobs across all major job classes in state government. Between August and October 2018, Accenture and NASCA surveyed state chief administrators and HR directors in 33 states on the future of their workforce. The survey included questions that aligned with Accenture’s global study as reported in Reworking the Revolution, enabling comparison between state government executives and commercial C-suite leaders. Read our report, Job One: Reimagine Today’s State Government Workforce, to learn more about the current state government hiring challenge and how your organization can recruit more effectively. 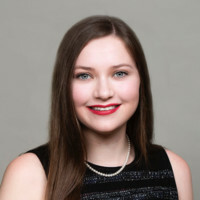 Libby Bevin is a content writer and editor for NEOGOV. Libby earned a Master of Arts in English Literature and Language from Wake Forest University and a Bachelor of Arts in English and History from Stetson University. Contact Libby at lbevin@neogov.net.